The Zhou Clan was an ancient tribe living in the Loess Plateau. In the early years of the 11th century BC, it gradually developed into a new powerful western force. The Zhou clan's increase threatened the sovereign of the Shang Dynasty (16th - 11th century BC). The contradictions between the two communities intensified, and Wending, King of the Shang Dynasty assigned his followers to have Jili, the leader of the Zhou clan, killed. Then, Chang, son of Jili, inherited his father's position. Chang was kind and lenient to the common people, and delighted in honoring worthy men of letters. As a result, capable people all went over to his side, which made the Zhou clan stronger. In order to stabilize his sovereign, King Zhou, the last emperor of the Shang Dynasty, had Chang held in captivity for seven years. Finally, the people of the Zhou clan ransomed Chang with treasures and beauties. Thereafter, Chang pretended to be indulged in entertainment, and be obedient to King Zhou. In fact, assisted by Lv Shang, an outstanding militarist in Chinese history, Chang was kinder to his people, and began to advance production energetically. Under this situation, more and more vassals came to his side on one hand, and on the other, Chang went on some punitive expeditions to the allied forces of the Shang Dynasty and some intractable vassal sates. In the end, Chang got his own territories and strong forces, and made himself King, that is King Wen, with Fengyi (Chang'an District of Xian City today) as the capital. Nine years later, King Wen died. Jifa, son of King Wen inherited the throne, who was King Wu. Jifa continued to respect Lv Shang as his counselor, and make Zhougong, Shaogong, and Bigong as his main assistants. Taking over his father's unfinished ideal, Jifa prepared to overthrow the tyranny of King Zhou actively. After two years' preparation, Jifa called together all the vassals who were joined to him in Mengjin (Mengjin County, Henan Province today), and then lead his army to the east. In February of the next year, Jifa's army defeated the army of the Shang Dynasty in Muye (the area to the south of Qi County, Henan Province, and to the north of the Weihe River today). King Zhou burned himself to death in despair during the war, which signaled the end of the Shang Dynasty. 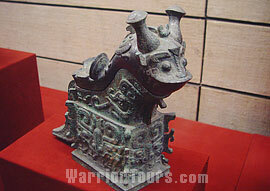 Then, Jifa established Zhou Dynasty, the longest dynasty in Chinese history. The Zhou Dynasty experienced over 800 years' history, having 37 emperors. 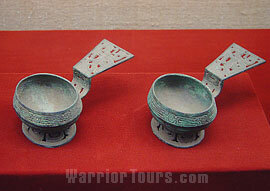 It was divided into the Western Zhou and Eastern Zhou. The Western Zhou was the period from the 11th century BC to 771 BC when King You was killed by Quanrong, a barbarian tribe living to the west of the Zhou Dynasty. In 770 BC, King Ping of the Zhou Dynasty moved the capital from Fengyi to Luoyi (Luoyang City, Henan Province today). Since then, the Eastern Zhou began, whose ruling area covered the Yellow River and Yangtze River watersheds as well as the majority of northeast and north China in ancient times. The Eastern Zhou was subdivided into the Spring and Autumn Periods (770 BC – 476 BC) and the Warring States Periods (476 BC – 221 BC), so it is also named the Spring and Autumn Periods and Warring States Periods. During the Eastern Zhou, China was torn apart and wars continuously happened. In 221 BC, the First Emperor of Qin unified China, and the Zhou Dynasty came to its end.